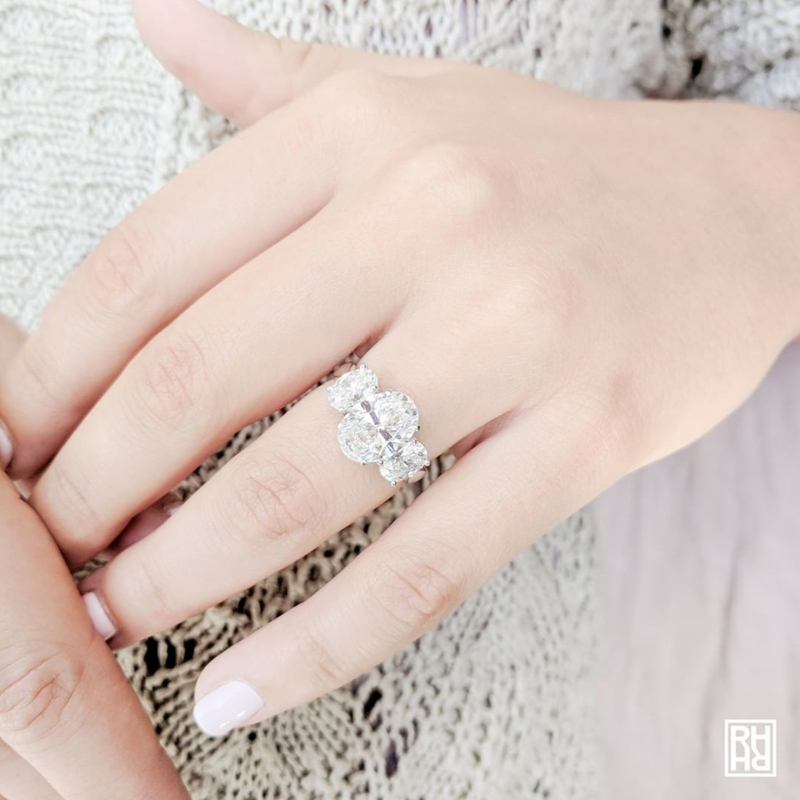 Oval cut engagement rings are one of the hottest styles of 2019. The centerpiece of all oval engagement rings is a glittering, brilliant oval cut diamond. The oval diamond is chic and sophisticated. It has a classic look, but is a bit more unique and eye-catching than other traditional styles. Oval diamonds also look beautiful with any precious metal, so they can work with any setting style. White gold, platinum, yellow gold, and rose gold all work beautifully for oval diamond settings. Additionally, among fancy shaped diamonds (which is a term for all diamonds that aren’t round), oval diamonds are one of the most brilliant. They feature a modified round brilliant cut, which gives them a stunning shimmer. Do you want an engagement ring that’s as unique as your love? Then the unique engagement ring trend might be right for you. Unique engagement rings have become incredibly popular in the last few years. More and more brides are gravitating toward unique engagement rings, largely because they’re a great way to make an engagement ring feel even more personal. A unique ring allows you to express your personal style and individuality. If you’re considering a unique engagement ring, you have many non-traditional options to choose from. You can choose from unique designs like gemstone rings, rings with east west settings, white diamond rings with gemstone accents, mixed metal rings, rings with unique shapes, and so much more. Another unique engagement ring option is going custom. It’s easier than you might think to create a custom ring and it’s usually not more expensive than buying a pre-made ring. So if you have something particularly unique in mind, consider finding a jeweler who specializes in creating custom designs. Cushion cut engagement rings have a romantic, vintage look that modern brides can’t seem to get enough of. The cushion cut diamond, characterized by its rounded yet square shape, has a vintage feel because it was the most popular diamond shape of the 19th century. Cushion cut diamonds are a beautiful choice for an engagement ring. They have a lovely, classic style and are also particularly fiery, which means they reflect more rainbow colored light than other diamond cuts. If you want to enhance the romantic appeal your cushion cut diamond engagement ring, consider pairing your cushion cut diamond with a rose gold setting, another big trend of 2019. These cushion designs, which combine the vintage appeal of cushion cut diamonds with the romantic beauty of rose gold, are incredibly romantic and perfectly on-trend. Three stone engagement rings are traditional and carry a beautiful sentiment. Each of this style’s three center diamonds represents a different time in your life as a couple: your past, present, and future. While three stone engagement rings are always a popular choice, lately they’ve been having a major revival. Perhaps the main reason for this revival is Meghan Markle’s stunning three stone engagement ring. Her one-of-a-kind engagement ring is crafted from yellow gold and features three diamonds: a three carat cushion cut diamond center stone that Prince Harry sourced from Botswana and two smaller diamonds that once belonged to Princess Diana. In 2019, the increased popularity of this style has led to the release of new three stone styles, which, unlike Meghan Markle’s classic yellow gold and diamond ring, often have more modern and unique touches. Among these new designs, you’ll see triple halo three stone engagement rings, mixed diamond shapes, more variation on the sizes of the three diamonds, and gemstone three stone rings. These new variations on three stone rings offer the best of both worlds. They’re sentimental and traditional, yet also modern and unique. Every engagement ring is a part of an engagement set, which includes your engagement ring and wedding band. We’ve talked a lot about engagement rings styles, but what about wedding ring styles? Sleek wedding rings are, by far, the most popular wedding ring style of 2019. Sleek wedding rings are beautiful, yet unassuming. This simple wedding ring style is the perfect complement to almost any engagement ring. Sleek rings are perfect when paired with simple, traditional engagement rings. Yet, they’re also an excellent choice to pair with more bold, intricate engagement rings, as they complement them without being distracting. Which Engagement Ring Style Is Right For You? Did you see a style that speaks to you? Once you’ve found your perfect engagement ring style, the only thing left to do is to plan a fun, memorable wedding for your guests! If you’re onto the wedding planning stage, be sure to check out our post on how you can plan a fun, memorable wedding. [Guide] What Are “Artisan Created” (AKA, Man-Made) Diamonds All About? Should You Get an Engagement Ring for Your Second Marriage?